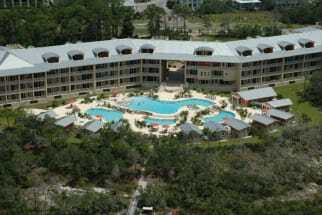 Located along the east side of Big Redfish Lake on Scenic Highway 30A near Blue Mountain Beach, Sanctuary at Redfish offers luxury condos with top amenities and great views. Sanctuary is in an ideal location near prime shopping, restaurants, and bike trails. Views of the Gulf of Mexico and Big Redfish Lake make it a serene getaway spot. Sanctuary at Redfish is truly a magnificent gem on the Emerald Coast. Here you will find the luxury and serenity of one of the best resorts in Florida set amidst the natural, surrounding preserve. Sanctuary at Redfish blends luxury seamlessly with the natural beauty of Big Redfish Lake. Sanctuary at Redfish provides a wide selection of prime amenities. The expansive pool deck features three swimming pools, jacuzzies, and private pool cabanas. Two outside grills and a large fire pit provide an outdoor dining experience. At the lake, there is a covered dock where guests can relax, fish or board the pontoon boat (March - October) for a scenic boat ride through the lake to the beach. The resort also boasts a fitness center and covered parking. Plan your next vacation with Emerald Coast By Owner. Booking a Sanctuary at Redfish condo with ECBYO will assure you are in direct contact with the owner. Booking direct will provide you better insight on the property and assure you are getting the best rate as you will not be paying any service fees.